Just like the Ruben Grinder, Klentak's Korner tracks each of Phillies general manager Matt Klentak's major transactions, trades, signings, releases, and basically any major move the Phillies general manager makes. Matt Klentak was born and raised in Medfield, Massachusetts. 2003: Theo Epstein, the general manager of the Boston Red Sox at the time, helped land Klentak an internship in baseball operations with the Colorado Rockies. 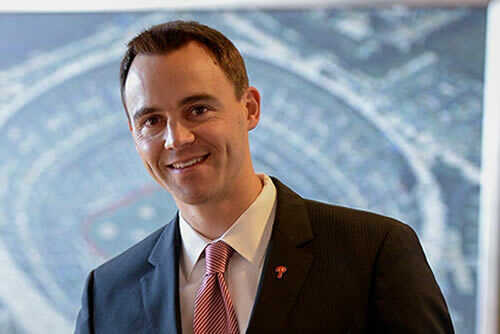 2004: Klentak worked in the Commissioner’s Office in 2004 with a part-time job in the Labor Relations department and worked his way into a full-time position as Senior Coordinator in Salary and Contract Administration. Feb 26, 2008: Named as Director of Baseball Operations for the Baltimore Orioles, where he assisted President of Baseball Ops, Andy MacPhail. November 23, 2011: Became the assistant general manager of the Los Angeles Angels. October 26, 2015: Klentak was officially named Vice President & General Manager of the Phillies. At the age of 35, Klentak became youngest GM in Phillies history. November 14: Acquired right-hander Jeremy Hellickson from the Arizona Diamondbacks in exchange for rookie league right-hander Sam McWilliams. December 1: Claimed right-hander Michael Mariot off waivers from the Kansas City Royals. December 2: Claimed outfielder Peter Bourjos off waivers from the St. Louis Cardinals. December 9: Signed right-hander David Hernandez to a one-year, $3.5 million contract. December 12: Acquired right-hander Charlie Morton from the Pittsburgh Pirates in exchange for single-A right-hander David Whitehead. December 12: Traded right-hander Ken Giles and rookie league infielder Jonathan Arauz to the Houston Astros in exchange for right-hander Vince Velasquez, left-hander Brett Oberholtzer, double-A right-hander Mark Appel, rookie league right-hander Thomas Eshelman, and single-A right-hander Harold Arauz. January 29: Claimed left-hander Bobby LaFromboise off waivers from the Los Angeles Angels of Anaheim. February 3: Acquired right-hander Yoervis Medina from the Pittsburgh Pirates in exchange for left-hander Jesse Biddle. March 25: Signed manager Pete Mackanin to a new two-year contract covering the 2016 and 2017 seasons, with a club option for the 2018 season. June 1: Acquired infielder/outfielder Jimmy Paredes from the Toronto Blue Jays for cash considerations. June 9: Selected outfielder Mickey Moniak with the No. 1 overall pick in the 2016 First-Year Player Draft. November 7: Acquired right-handed pitcher Pat Neshek from the Houston Astros in exchange for a player to be named later or cash considerations (believe they accepted cash) and exercised Neshek's club option for the 2017 season. November 11: Acquired outfielder/infielder Howie Kendrick from the Los Angeles Dodgers in exchange for first baseman Darin Ruf and triple-A second baseman Darnell Sweeney. November 18: Designated right-handers David Buchanan and Jimmy Cordero for assignment. December 2: Claimed left-handed pitcher David Rollins off waivers from the Texas Rangers. December 6: Signed right-handed reliever Joaquin Benoit to a one-year, $7.5 million contract. December 14: Re-signed infielder Andrés Blanco to a one-year, $3 million contract. December 15: Signed center fielder Odubel Herrera to a five-year, $30.5 million contract through the 2021 season, plus club options in 2022 ($11.5 million with $2.5 million buyout) and 2023 ($12.5 million with $1 million buyout). December 20: Acquired right-hander Clay Buchholz from the Boston Red Sox in exchange for single-A minor league second baseman Josh Tobias. January 19: Signed outfielder Michael Saunders to a one-year, $8 million contract with a $11 million club option and $1 million buyout for the 2018 season. April 5: Double-A outfielder Tyler Goeddel selected off waivers by the Cincinnati Reds. April 22: Acquired infielder/outfielder Ty Kelly from the Toronto Blue Jays for cash considerations. May 11: Signed manager Pete Mackanin to a new two-year contract, extending him through the 2018 season, with a club option for the 2019 season. June 12: Selected 21-year-old University of Virginia outfielder Adam Haseley in the first round (8th overall) of the 2017 First-Year Player Draft. June 20: Designated outfielder Michael Saunders and reliever Jeanmar Gomez for assignment (both released June 24). July 26: Traded reliever Pat Neshek to the Rockies for single-A shortstop Jose Gomez (ranked as Rockies' 21st best prospect by MLBPipeline.com at time of trade) and single-A right-handers Alejandro Requena and J.D. Hammer. July 28: Traded Howie Kendrick and cash to the Nationals for single-A left-hander McKenzie Mills (ranked as Nationals' 18th best prospect by MLBPipeline.com at time of trade) and international bonus pool money. July 28: Traded Jeremy Hellickson and cash to the Orioles for outfielder Hyun Soo Kim, double-A left-hander Garrett Cleavinger and international bonus pool money. Phillies claimed roughly $1 million total in international bonus pool money with both trades. July 31: Traded right-hander Joaquin Benoit and cash considerations to the Pittsburgh Pirates in exchange for single-A right-hander Seth McGarry. August 31: Claimed right-hander Juan Nicasio off waivers from the Pittsburgh Pirates. September 6: Traded right-hander Juan Nicasio to the St. Louis Cardinals for 2B Eliezer Alvarez. September 29: Fired Pete Mackanin as manager, but will remain with Phillies as a special assistant to the general manager. October 30: Hired Gabe Kapler as manager. December 15: Traded shortstop Freddy Galvis to the San Diego Padres in exchange for 21-year-old right-hander Enyel De Los Santos. December 15: Signed right-handed relief pitchers Pat Neshek to a 2 years/$16.25 million contract and Tommy Hunter to a 2 year/$18 million contract. December 20: Signed switch-hitting first baseman Carlos Santana to a 3 years/$60 million contract. March 12: The Phillies have signed right-hander Jake Arrieta to a 3 year/$75 million contract. June 4: Selected Alec Bohm, a 21-year-old third baseman from Wichita State University, in the first round (No. 3 overall) of the 2018 First-Year Player Draft. July 27: Acquired infielder Asdrubal Cabrera from the New York Mets in exchange for right-hander Franklyn Kilome. July 31: Acquired catcher Wilson Ramos and cash considerations from the Tampa Bay Rays in exchange for a player to be named later or cash considerations (Marc Topkin confirmed via twitter on Aug 15 that Rays took the cash). July 31: Acquired left-hander Aaron Loup from the Toronto Blue Jays in exchange for right-hander Jacob Waguespack. August 12: Acquired first baseman Justin Bour and cash considerations from the Miami Marlins in exchange for minor league left-handed pitcher McKenzie Mills. August 22: Acquired left-handed reliever Luis Avilán from the Chicago White Sox in exchange for minor league right-hander Felix Paulino. August 28: Acquired infielder/outfielder José Bautista from the New York Mets in exchange for a player to be named later or cash considerations. December 3: Acquired infielder Jean Segura, right-handed pitcher Juan Nicasio and left-handed pitcher James Pazos from the Seattle Mariners in exchange for infielders J.P. Crawford and Carlos Santana. December 6: Acquired left-handed pitcher José Álvarez from the Los Angeles Angels in exchange for right-handed pitcher Luis García, the club announced tonight. December 12: Signed free-agent outfielder Andrew McCutchen to a 3 year/$50 million contract.